UPDATE: Walsenburg Schools (John Mall and Peakview) are closed today, due to no water. Gardner School is operating on a normal schedule. How would it impact funding for Huerfano Re-1 School District? Based on the most recent CDE estimates for 2018-2019, Huerfano Re-1 School District would receive $1.0 million in additional ongoing revenue if the initiative were implemented for the 2018-2019 school year. Amendment 73 – Huerfano Re-1 Numbers The A73 estimate is based on current student count and demographics that are subject to change. Funding estimates will be revised when updated data is released. How is funding stabilized and raised? A73 is a property tax decrease for nonresidential property owners and it stabilizes the local share of school funding by permanently setting property tax assessment rates. A73 will prevent future reductions to the residential assessment rate (RAR) as currently required by the Gallagher Amendment. It permanently sets the RAR at 7% (currently 7.2%), and decreases and permanently sets the assessment rate at 24% (currently at 29%) for business property owners, farmers and ranchers — for property taxes levied by school districts. A73 is an income tax increase for 8% of Colorado tax filers with taxable income (income after exemptions and deductions) over $150,000. In addition, A73 increases the state corporate income tax rate by 1.37% for “C” Corporations (does not include LLCs, sole proprietorships and S corporations ). A73 raises $1.6 billion in revenue that is deposited in the Quality Public Education Fund. How will the revenue be spent? The initiative allows school districts to make local decisions about the best use of new funds that reflect local community priorities and needs — examples of how funding could be used include programs supporting mental health, safety and security, career and technical education, school maintenance and repair needs, reducing class size, etc. A73 cuts property tax assessment rates only for property taxes levied by school districts. Property taxes levied by other local governments are unaffected by A73. Will the drop in property tax rates hurt school funding? No. Setting the residential assessment rate at 7.0% and the nonresidential assessment rate at 24% for mills levied by school districts, the measure decreases local property tax revenue to fund P-12 public schools in FY2019-2020. However, under the School Finance Act, each district’s local share is calculated first, and state aid makes up the difference between the local portion and the total funding need identified through the formula. 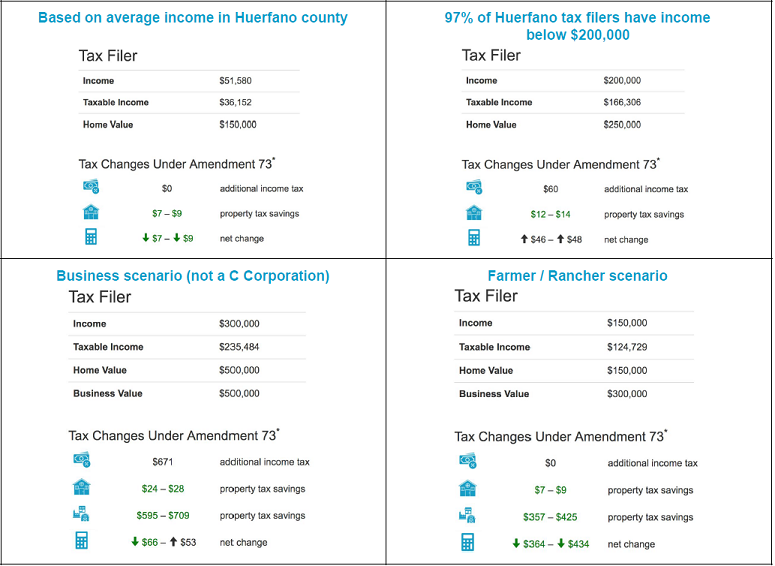 What percentage of tax filers will be impacted in Huerfano county and by how much? local mill and bond elections. Visit www.cosfp.org/impactcalculator to utilize the A73 Impact Calculator to input your own scenario. The state needs a sustainable source of revenue to adequately and equitably fund public education. compared to residential property owners. One of government’s most important functions is to provide children with a high-quality education. Stabilizing the local share of required school formula funding and creating a dedicated source of state revenue for education provide additional flexibility for the state to use more of its general operating budget on other core programs, such as transportation, public safety, and health care. The measure imposes a tax increase without any guarantee of increased academic achievement. less money to spend, save, and invest. The measure complicates an already complicated property tax system. By creating one assessed value for school districts and another assessed value for all other local taxing entities, the measure will lead to confusion among taxpayers and further complicate tax administration for state and local governments. The measure does not allow the state legislature to adjust the income tax thresholds to account for inflation.